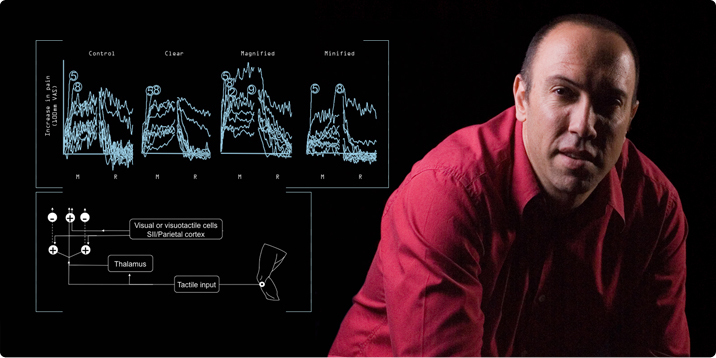 Prof Lorimer Moseley is a clinical scientist investigating pain in humans. Lorimer joined NeuRA from The University of Oxford, UK, where he was Nuffield Medical Research Fellow in the Departments of Clinical Neurology and Physiology, Anatomy & Genetics. In 2011, Lorimer was appointed Prof of Neuroscience and Foundation Chair in Physiotherapy at the University of South Australia, sharing his time between Adelaide and NeuRA, where he remained Group Leader. In 2015, Dr James McAuley took over leadership of what then became ’the McAuley group’ and Lorimer maintains a collaborative role as a NeuRA Senior Principal Research Fellow. Professor Moseley’s Adelaide-based research group and the McAuley group form the Body in Mind Research Group. For all projects in which Prof Moseley is involved, go here. Tissue damage is neither necessary nor sufficient for pain. The more we learn about pain the more this becomes apparent, most significantly when we consider the 20% of people for whom quality of life is reduced by a chronic pain problem. I undertake studies that aim to increase our understanding of why things hurt, why things keep hurting and how we can better prevent and manage chronic pain in the community.